This is virtually a remake of the previous year's Anna Neagle / Michael Wilding smash hit Spring in Park Lane. Director (and Mr Neagle) Herbert Wilcox, who also co-produced with his wife, knew when he was on to a good thing, and this time added Technicolor. The plot might remind Neagle fans of an even earlier movie, Irene, with its dress-shop rivalry, once so fashionable and today so dated. Neagle looks rather too old and staid to partner the charming Wilding, but a hard-working supporting cast, including Tom Walls, Nicholas Phipps (who also wrote this soufflé), Peter Graves (the British one!) and Thora Hird, keeps the fun bubbling. 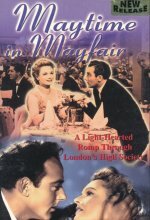 In their day, movies such as these offered a sort of genteel postwar chirpiness and were welcomed by a grateful British public.